This 3 bedroom apartment is located in Deauville and sleeps 6 people. It has WiFi, garage and parking nearby. The apartment is within walking distance of a beach. Built in 1638, this stunning Norman manor is truly something special. The very spacious interior includes six bedrooms, which all benefit from an en-suite bathroom. Nestled amidst gentle countryside, between Pays Picard and the Country of Caux, this elegant home is a fantastic choice for a relaxing holiday. It boasts a beautiful indoor swimming pool. This 5 bedroom house with private pool is located in Perriers-en-Beauficel and sleeps 9 people. It has WiFi, a garden and barbeque facilities. The house is near a beach. This 4 bedroom house is located in Saint-Pair-sur-Mer and sleeps 8 people. It has WiFi, a garden and barbeque facilities. The house is near a beach. 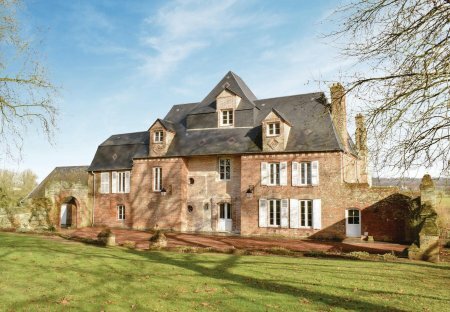 Set in a peaceful hamlet close to the château town of Falaise, this beautifully restored, part timber-framed property stands in extensive, mature gardens with a private, fenced swimming pool. 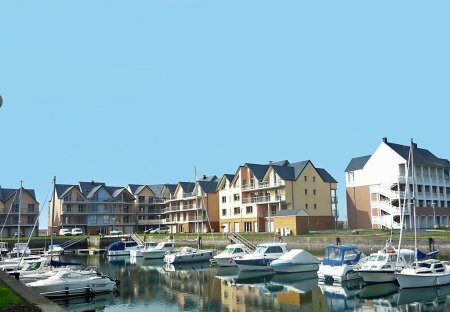 This 1 bedroom apartment is located in Port Littoral-Ville Nord and sleeps 2 people. It has WiFi, parking nearby and a gym. The apartment is within walking distance of a beach. This 2 bedroom apartment is located in Port Littoral-Ville Nord and sleeps 5 people. It has WiFi, parking nearby and a gym. The apartment is within walking distance of a beach. This 3 bedroom house is located in Hennequeville-Zone Callenville and sleeps 6 people. It has WiFi, a garden and barbeque facilities. The house is near a beach. This 2 bedroom apartment is located in Aguesseau-Ville Sud and sleeps 4 people. It has WiFi, barbeque facilities and parking nearby. The apartment is near a beach. This beautiful three bedroom holiday home is nestled within peaceful surroundings and is a wonderful choice for a relaxing holiday. The charming property dates back to the 19th Century. This 1 bedroom apartment is located in Deauville and sleeps 4 people. It has WiFi, parking nearby and a gym. The apartment is within walking distance of a beach. This 5 bedroom house is located in Réville and sleeps 11 people. It has WiFi. The house is within walking distance of a beach. This 5 bedroom house with private pool is located in Tour-en-Bessin and sleeps 12 people. It has WiFi, a garden and barbeque facilities. The house is near a beach. This four bedroom holiday apartment offers a taste of luxury on the pretty Normandy coastline. The apartment's location, just 300 metres from the nearby sandy beach. This 3 bedroom apartment is located in Benerville-sur-Mer and sleeps 6 people. It has WiFi, parking nearby and a gym. The apartment is within walking distance of a beach. This 4 bedroom house with private pool is located in Lengronne and sleeps 9 people. It has WiFi. The house is near a beach.